Preheat oven to 350°F (180°C), place a rack in the upper third of the oven. Lightly grease a 9×13-inch baking pan. Line the pan with foil and grease the foil. 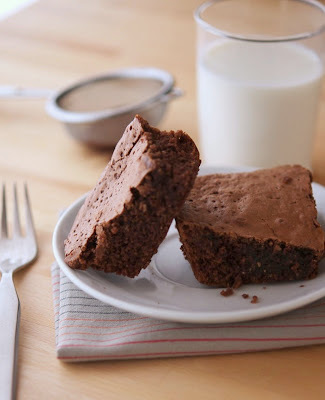 This will help you remove the brownies. Whisk together protein powder, ground oats, baking powder and salt and set aside. Place coconut oil (or butter) and chopped chocolate in a medium sized heat proof bowl. Place the bowl over a pot of simmering water (making sure that the bottom of the bowl does not otuch the water). Stir until the chocolate has completely melted. Remove the bowl from over the boiling water, let mixture sit for a few minutes. In the meantime, in a large bowl mix sugar, vanilla, espresso powder (if using) and eggs (or flax eggs or egg whites). Whisk until pale and thick.Pour the melted chocolate into the egg mixture. Whisk until batter is smooth. Add the protein powder mixture all at once and stir by hand until all the dry ingredients are incorporated into the wet ingredients and no flour is visible. Pour batter into the pan and bake for 30 minutes, until the center is firm and level with sides and a skewer inserted in the center comes out clean.